As South Africa grapples with how to implement “universal health service” via the National Health Insurance, a specialist advises more pragmatism and less ideology. Just as the apartheid regime fed its supporters with horror stories about marauding ‘Reds’ out to confiscate everything privately owned, so some post-apartheid ANC leaders have made the private sector synonymous with everything that is greedy and selfish. Like most things, the truth is often found somewhere in between, which is why the “triple Ps” – public-private partnerships – can be effective in delivering services by harnessing the public sector’s mandate to deliver services to all with private sector’s often more efficient delivery mechanisms. Professor Morgan Chetty, head of the Independent Practitioners Association Foundation (IPAF) and an associate professor at the University of KwaZulu-Natal, has been promoting PPPs in health for a while now. Government seems to believe that if there is private sector involvement in healthcare delivery, this will somehow deprive it of its right to provide healthcare, Chetty told a media summit convened last week by Discovery Health. The NHI aims to unite public and private healthcare resources to ensure that everyone living in South Africa has access to the same standard of health care that is free at point of service (but paid for via mechanisms yet to be agreed on, but possibly via a VAT increase and compulsory contributions by all working people). One of the biggest challenges to achieving “universal service” is the shortage of doctors and specialists, who are in demand worldwide and constantly being enticed to work in other countries. Back in 2012, government set up 11 NHI pilot districts – supposedly to experiment with ways in which to introduce “universal service”. One of the things that the health department has been piloting in its pilot districts is contracting private doctors to work in its clinics and hospitals. But this has been a failure in virtually all districts. Some doctors who spoke to Health-e News on condition of anonymity said that they had quit the scheme because working conditions were so bad that they could not offer a decent service to patients. The fee being offered – R465 an hour in rural areas and R381 in urban areas – was far lower than what the GPs could earn in private practice, which made them even less inclined to accept poor working conditions. Some doctors have said that they would be prepared to see public patients in their private consulting rooms where they have access to equipment and feel more secure. But the health department has not tried to do this. The pilots, note many critics, are not providing answers to the many difficult questions of how to implement universal service because they are not experimental enough. Professor Eric Buch, dean of the medical school at the University of Pretoria, says the NHI pilots should be actively testing different models, including those for GP contracting. “The NHI pilots should not mean extra money to fix buildings. One approach would be to take the NHI pilot site money and invite proposals for ideas on how to implement universal service or to get the pilots to test a range of different ideas,” says Buch. He said told Members of Parliament to “brace yourselves for massive legislative and structural alterations to both the private and public healthcare systems, in order to prepare for NHI”. 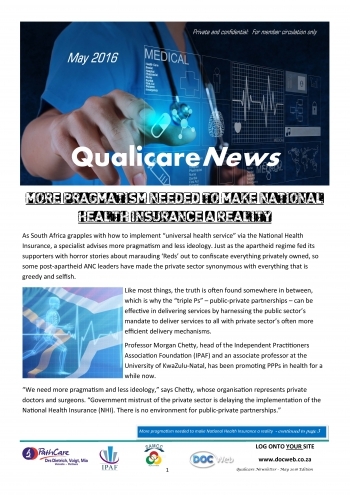 “NHI is not a beauty contest between the private and the public sectors as many who belong to this selected 16 percent [who have medical insurance] like arguing, but it represents a desire to share so that the population can best utilize what both systems have to offer rather than segmentalised in a way not consistent with our Constitution,” argued the Minister. The two-tier system of healthcare in South Africa – one for those with money and the other for those without – is an apartheid hangover that is against the spirit of our Constitution, which guarantees people’s right to “access to healthcare services” as well as to “have their dignity respected and protected”. But government has been unable to view private healthcare providers as potential partners in the quest for universal service. There is no doubt that some medical aid companies exploit sick people to make large profits. But there is also no doubt that many have developed sophisticated ways of delivering services to large numbers of patients that include weeding out fraudulent claims and fake services.